of instrument change the magnification continuously range of 0.7x to 4.5x . 1. It has the crisp and erect images with high resolution and exellent stereoscopic effect. 2. 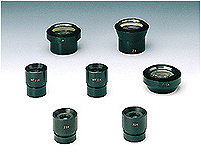 The eyepieces ( WF10x ) with wide field ( the linear field of the eyepieces is Ø23 ). 3. The binocular observation tube is inclined into 45°degree. The interpupilar distance can be adjustment range from less than -5 to more than +5. These made the observation very comfortable . 4. The two zoom control rings at each side of the head and their axis is horizontal which make the operation very easy . 5. The microscope head which with bincular lens can be rotated a full 360°degree and can be locked in any position desired . 6. It is designed as Modular System that can furnish varies of accessaries . 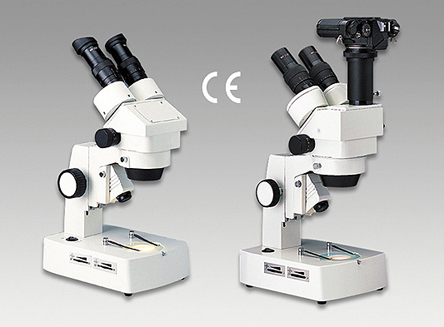 SZ-3000 series of stereo zoom microscope can be widely used in electronics and precision machine industries for assembling and inspection of products. In particular it is suitable for micrography and observation of fine structure of irregular bodies because of its high resolution and clear imaging within a broad field of view, and is also suitble for educational purpose in schools and hospitals. It can be used in agriculture, forestry, medical service, geology, archaeology and biology as well . Model SZ-3000 is a binocular head designed for routine use applications such as small parts inspection, assembly and dissection. Model SZ-3003 trinocular head is equipped with all the connections as standard features, making CCTV operation or a camera photo shot both easy and a joy. The optional 0.5x objective lens, 1.5x objective lens and 2x objective lens will provide the user with different choices of magnification, working distance and field of view. The modular design nature of the head will allow unlimited application in education, industry, OEM application, laboratory and even personal use. 1. Plain with head holder, no light. 2. Top 6V/15W halogen light bulb and bottom 6V/12.5W halogen light bulb, pole type base with intensity variable on both lights. 3. Top 6V/15W halogen light bulb and bottom 5W fluorescent light, pole type base with intensity variable on top light.Industrial pod with mechanical movement that can fit pole size with diameter 25mm. Electrical: All electrical parts are arranged according to CE, VDE, UL and CSA requirements. Design Change: The manufacturer reserves the right to make changes in instrument design in accordance with scientific and mechanical progress, without notice and without obligation.